1 Add big pinch salt + big pinch sugar and a cup of water to the methi leaves and let it rest for a few mts. Squeeze out the water from methi and keep aside. 2 Heat ghee or oil in a vessel, add the grated ginger and asafoetida and saute for a few secs. Add onions and saute for 3 mts. Add coriander pwd and red chilli pwd and combine. Add the chopped methi and spinach leaves and cook till wilted, approx 10-12 mts. 3 Add the cubed boiled potatoes and salt and combine. Cook for 9-10 mts. This is a dry saute dish. hi sailu…ur so sweet….that i can see new recipes in ur blog very often nowadays.and todays recipe aloo methi is looking very good. ya sailu ur right ….we can use methi as much as we can. i remember my mom used a lot of methi in recipes. pudina and kothimeer also. methi in keema also tastes good sailu. and sailu….can u post chicken methi? thanks and bye sailu. I will post Methi Murgh, Rani. 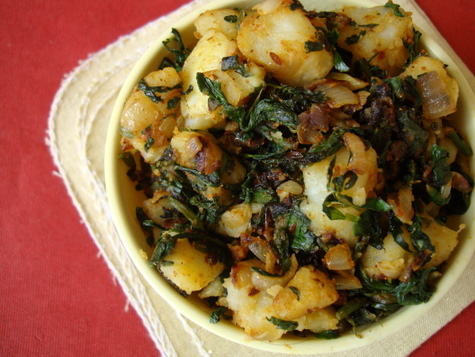 Aloo and methi make a delectable combo. Made this several times and as you say never got tired of Methi. Love this aloo methi with chappatis, I add about half a tomato when making as a side dish for chappatis. Sailu.. I love aloo methi! 🙂 Yours looks amazing. I live in New Zealand. it is hard to get fresh methi. can this be substituted with kasoori methi? thank for all the great recipes. Your are doing a great service to mankind/womenkind. Yes, you can use kasuri methi, Sarita. It has a slightly different flavor but you can make do. 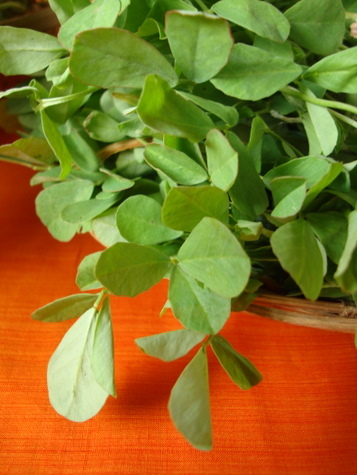 Reduce the quantity of dried kasuri methi while preparing. I just admire your North Indian recipe collection. The recipes are so simple and easy to follow. Since we don’t get Methi leaves easily and frequently here,I use Kasuri Methi (dried Methi powder) for Aloo Methi. Yuuum! I’d love some of this now! Grate Soarakaya.squeeze the water out of it. mix it with besan, chilli, salt,kothimeera . make balls of this mixture and fry them. then u make some gravy and soak the fried balls in this gravy. It is a great recipe.Plz do post the recipe . Thanks! à°¸à±‡à°®à± à°ªà°¿à°‚à°šà±.. à°‡à°«à±à°ªà±à°¡à±‡ à°‡à°¦à±‡ à°•à±‚à°° à°šà±‡à°¸à°¿ à°µà°šà±à°šà°¾. à°®à±€à°°à± à°…à°¦à±‡ à°°à±†à°¸à°¿à°ªà°¿ à°ªà±†à°Ÿà±à°Ÿà°¾à°°à±. à°¬à°‚à°—à°¾à°³à°¦à±à°‚à°ª, à°®à±†à°‚à°¤à°¿à°•à±‚à°° à°­à°²à±‡ à°•à°¾à°‚à°¬à°¿à°¨à±‡à°·à°¨à±. à°§à°¾à°‚à°•à± à°¯à±‚ à°¶à±ˆà°²à°œà°—à°¾à°°à±..
Sailaja…when ever you have some free time…please have a tour to my blog and give me your valuable suggestions/tips/comments. looks like today is metho-aloo day….i just watched MAA TV Maavoori Vanta On Maa TV EST time and she made methi aloo today on her show…. what a coincidence…..
Aloo Methi is a good looking (photogenic)picture as well as good tasting dry dish. Here in USA we get fresh Methi leaves and also plenty of Potatoes (Aloo), only I need to find some time to make the dish. Making fresh roti is another story. I will try this dish as soon as possible. Keep up with the good work sailu! Yes, Sarita, you can use dried methi leaves. Wonderful Sailu.. Any recipe is awesome in ur website .. Can you also please post the recipe for methi paratha?? Just sick of eating the frozen parathas all the time.. I have blogged Methi Paratha recipe at Kids Zone, Mrudula. Sailu I made this tonight for dinner. I did adjust the spices slightly and left out onions. It tasted quite nice. It’s a nice winter-time food to warm you up! The only thing is the patience required to pluck the leaves from the stems! 😉 Thanks for posting. I keep following ur site . Some time back i had deliciiiious methi pulav/methi rice?? from my tamil friend’s lunch box. From then onwards m looking for its recipee. I tried some recipees from the net , but didnt come out well. Could you please post it. Am sure urs will turn out closer to my friend’s recipee. I was wondering the reason behind allowing the methi leaves to rest in Salt and Sugar water. Is it to get rid of methi leaves bitternes? i have tried several of your chicken curry recipes and they have always turned out fantastic – thank you ! im going to try this aloo methi tomorrow .How many tsp garam masala do we add? Your welcome. A large pinch of garam masala will do. good recipe!it came out good too..but whr are u using cumin in this recipe?u havent mentioned that.. I did equal amounts of methi & spinach, and did not go wrong! This is great blog and Aloo methi leaves stir fry recipe is my favorite recipe. I love allo methi , thanks for sharing this recipe…………. Add cumin seeds at Step 2 before adding ginger.